Purchasing a subscription to the 2015/16 Boston Lyric Opera Season is another way to fly off to Paris. Two of the works on the schedule are set in the city of light and lovers. The first, La Bohème, is by an Italian, Giacomo Puccini; the other, The Merry Widow (Die Lustige Witwe) is by an Austro-Hungarian composer, Franz Lehár. The third, Werther, is by Jules Massenet, a composer who lived in Paris. In this opera, he adapted one of the most influential German novels, Goethe’s The Sorrows of Young Werther. 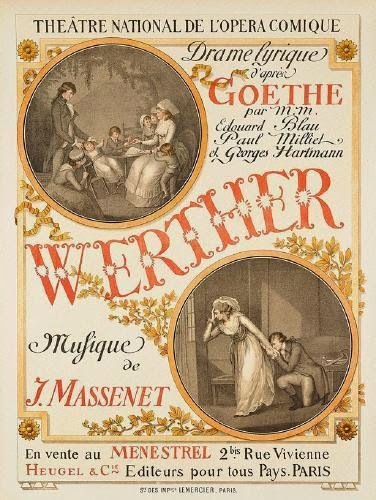 Goethe’s story is set in a suburb of Frankfurt, but in the spirit of the Season’s theme the stage director, Crystal Manich, and designer, John Conklin, plan to transport Werther to a suburb of Paris and to present it in the visual style of the celebrated French film director, Jean Renoir. So the Season brings three strongly contrasting operas written within a span of 15 years, but linked in many ways by Paris, the city on the Seine. No composer can help writing in his native idiom any more than he can help being influenced by the colors and rhythms of his native language, even when he is trying not to. Bizet wrote some of the most vivid “Spanish” music anyone ever composed, but Carmen remains a totally French opera. Puccini loved Paris and set four of his operas there, and in each of them there are touches of local color comparable to the Japanese effects in Madama Butterfly or the Chinese scales in Turandot. There are some French touches in La Bohème, but basically this is Italian music in which small or “unimportant” people feel huge emotions and unleash them in full-throated song. Original 1896 La bohème poster by Adolfo Hohenstein.  Licensed under Public Domain via Wikimedia Common. 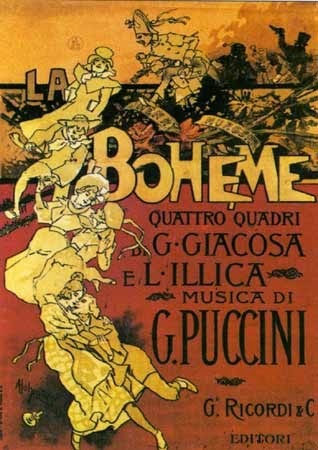 La Bohème is Puccini’s most popular work, and in fact it is currently the most popular opera in the world, surpassing even Verdi’s Aida, which held the record for decades. Since the Metropolitan Opera’s first performance of La Bohème in 1900, the company has given over 1,500 more (the legendary Nellie Melba was the first Met Mimì, and she gratified her audience, which may have been sorely tried by Puccini's "modern" music, by rising from Mimì’s deathbed to sing the Mad Scene from Lucia di Lammermoor as an encore, dying yet again). Puccini’s source was a series of magazine sketches of bohemian life that Henri Murger wrote, beginning in 1845. They didn’t find much of an audience, but later Murger and a collaborator adapted them into a stage play which became internationally popular; still later Murger assembled the sketches into a loose-limbed novel. Murger knew first-hand the world he was writing about because it was his own—he lived in the company of ambitious, spirited, and penniless young artists and musicians, their loves and quarrels, successes and failures, joys and despairs, intense lives and early deaths. The tragic story of Mimì and Rodolfo is only one strand in Murger’s narrative collage, but it captured the imagination of everyone who read it or saw it onstage. Anyone who has ever fallen in love can relate to the story, and hearing Puccini's music brings back all the turbulence and ecstasy of youthful love (Puccini was only 35 years old when he started work on this opera). This is one reason why older singers can still prove convincing in the opera—some readers may remember how affecting Carlo Bergonzi and Pilar Lorengar were on the Met tour here in 1977 when both of them were old enough to be the grandparents of Mimì and Rodolfo—and why other productions of the work have effectively set the story in times and places from 1845 to the AIDS crisis of the 1980s (this was the choice of the Broadway musical Rent, which used a contemporary score by Jonathan Larson to tell the old story again). BLO’s new production by director Rosetta Cucchi, with set designs by John Conklin, will unfold in Paris at the time of the epoch-defining student protests in 1968; the visual style is derived from the “New Wave” films of the same time by Jean-Luc Godard, François Truffaut, and others. The music has been recorded many times over, multiple stagings have made their way onto DVD, and there have been several movies. In 2002, the filmmaker Baz Luhrmann brought his famous 1990 Australian Opera production of La Bohème to Broadway, and one of the sopranos rotating in the role of Mimì was Kelly Kaduce, fresh out of Boston University; now one of America’s leading sopranos, she returns to Boston to recreate Mimì. Jesus Garcia, who was one of the Rodolfos in Luhrmann’s Broadway production, will repeat the role, and local favorite James Maddalena takes on the two character roles of Benoit, the lusty landlord, and Alcindoro, the equally lascivious elderly fop. It is difficult to imagine the scope of the success of Goethe’s novel, The Sorrows of Young Werther, which he published in 1774 at the age of 24. It was translated into many languages and read around the world; it defined a whole generation. The protagonist, who reveals his story and pours out his feelings in a series of impassioned letters, is a notable figure in the history of outsiders, a descendant of Hamlet and an ancestor of James Dean. He is a passionate romantic who falls in love with a woman he cannot have, Charlotte. Her mother has died, so Charlotte is bringing up her younger siblings; also, she is betrothed to another man that she had promised her mother she would marry. This is a situation from which there is no escape—except suicide. Some readers in Goethe’s time, and our own, have committed suicide themselves because their identification with the frustrations and sorrows of Werther became so complete. Massenet responded to the principles and the pain of his two leading characters with music of profound, self-revealing emotion; this is an opera that sweeps the public into a maelstrom of feeling. The music, of course, is French, although the influence of Wagner in the fluidity of the harmony is obvious. There is also a modern touch: Massenet introduces the saxophone into the orchestration, even though it had not been invented at the time of the story. The Belgian instrument maker Adolphe Saxe had invented the saxophone in Paris in the 1840s and was a colleague of Massenet on the faculty of the Paris Conservatoire. Massenet’s mastery of text setting is a paramount feature of the opera—in this he was like Puccini, investing little phrases with mounting intensity. And, like Puccini, he created great roles that continue to attract major singers—the tenor part of Werther is so irresistible that the great baritone Mattia Battistini wanted to sing it, so Massenet obliged him by rewriting the part for baritone. BLO’s production features a Company favorite as Charlotte, Sandra Piques Eddy, most recently seen here in Janáček’s Kátya Kabanová, and the BLO debut of the charismatic Canadian tenor, Joseph Kaiser. Although he is still in the first decade of his career, Kaiser has already sung major roles at the Metropolitan and other American companies, as well as in the great theaters of Europe; this will be his first Werther. 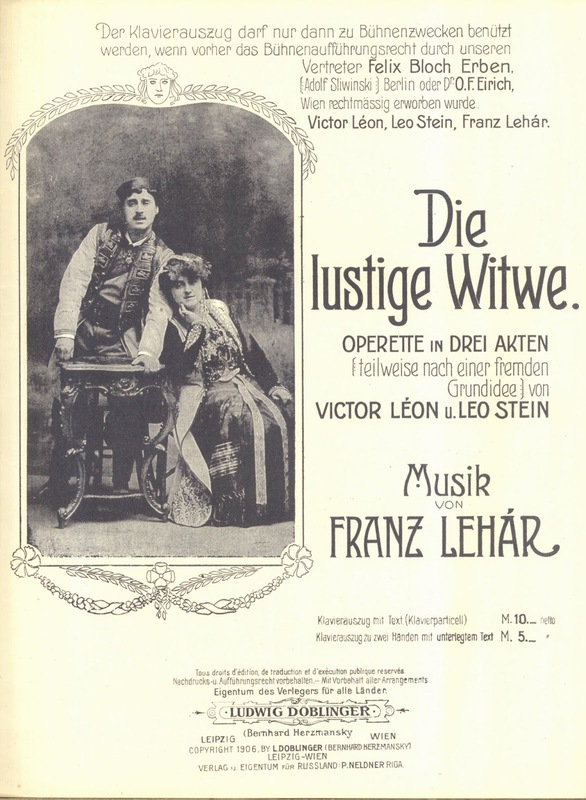 Nine years after the premiere of La Bohème, Franz Lehár’s The Merry Widow had its premiere in Vienna on December 30, 1905 and, like La Bohème, it has been performed all over the world ever since. Puccini, in one of the many intersections within the next Season, saw The Merry Widow and decided to write his own work in the same genre, La Rondine (the first act of which takes place in Paris!). Lehár’s story, about the attempt of an impoverished Pontevedrian government to keep the fortune of the country’s wealthiest new widow from passing into the pocket of a foreign suitor, comes from a slightly naughty French play by Henri Meilhac that was already 40 years old. (Meilhac is remembered today for the libretto he prepared for Bizet’s Carmen and his collaborations with Jacques Offenbach. In another link among the Season’s composers, Meilhac co-wrote the libretto for Massenet’s most popular opera, Manon, another opera set in part in Paris.) In a curious coincidence, a different play by Meilhac was the source for the only other Viennese operetta to rival The Merry Widow in popularity, Die Fledermaus by Johann Strauss, Jr.
We are in a different Paris from that of La Bohème—on the map, the Café Momus in the Latin Quarter where the Bohemians hang out isn’t that far from Maxim’s, on the Rue Royale on the other side of the Seine. But the revelers at Maxim’s have money, or pretend they do, and they come from a frivolous world devoted to the pursuit of both instant pleasure and constant gratification. However, sets of feet in both operas are only three beats away from being ready to waltz—in La Bohème, Musetta sings her famous waltz in the Café Momus, and she might well have flourished in a place like Maxim’s, except that it didn’t open until 1893, when she would have been in her 70s. Maxim’s may not have acquired its legendary and enduring reputation if it had not been for The Merry Widow. The plot of The Merry Widow is a contrivance, an intricate framework onto which Lehár hung a string of vivacious ensembles and seductive melodies in ¾ time. The operetta has triumphed onstage for more than a century, and there have been television productions and two movies, a great one with Maurice Chevalier wooing Jeanette MacDonald, and a dreadful one with Lana Turner and Fernando Lamas. The Turner movie, however, did inspire the “merry widow” undergarment that is still on sale at Victoria’s Secret and Frederick’s of Hollywood more than 60 years later. Since the premiere, glamorous sopranos have coveted the role of the merry widow and her haunting song “from her native land,” “Vilja,” which tells the sad and seductive story of a young huntsman who is bewitched by a wood nymph who then deserts him. In recent years, the role has become associated with such late-career divas as Beverly Sills, Joan Sutherland, and Frederica von Stade, who said she couldn’t imagine a nicer way to take leave of the Met than to waltz offstage in the arms of Plácido Domingo. Just this season, Renée Fleming and Deborah Voigt have taken on the role. BLO will break with recent tradition by presenting a widow young enough to be merry—the Metropolitan Opera’s vivacious Susanna Phillips, whose early career brought her twice to the Company, in Mozart’s Don Giovanni and in Benjamin Britten’s A Midsummer Night’s Dream. Canadian tenor Roger Honeywell will make his debut as the dashing Count Danilo. Honeywell began his professional career as a stage actor; since he trained his singing voice and made his operatic debut at the age of 34, he has successfully performed some of the most demanding roles in the operatic repertory as well as a few parts in operetta. The production, again designed by Conklin, promises lots of sparkle and spectacle while suggesting the fragility of this artificial world that would soon be swept away by World War I. Each of these operas is one that audiences take home with them, and each leaves lifelong impressions. They certainly have in mine. My first Bohème was on May 13, 1953, with the Met tour in Oklahoma City; I was 11 and I cried my heart out, and if I am at a good performance, I still will. My first Merry Widow was at the Kenley Players in Warren, Ohio in 1961, when the popular television comedienne Edie Adams appeared as the widow, astonishing the audience with her legitimate singing voice (she had studied at Juilliard). The effect was as startling as Lady Gaga’s performance of excerpts from The Sound of Music at the Academy Awards this year. Who knew? My first Werther was at the Opéra-Comique in Paris when I was 19, not far from Werther’s age. I was so overwhelmed, I went to every other performance that season—Alain Vanzo and Albert Lance alternated as Werther, Solange Michel and Rita Gorr as Charlotte. The soundtrack for my student year in Paris—Momus rather than Maxim’s—was written in part by Puccini, Massenet, and Lehár. I have known each of these works by heart for more than 50 years: There are some operas you can’t remember, but these are operas you can’t forget. In the world of contemporary opera, Philip Glass is one of the rare composers to have built a highly acclaimed and ongoing body of work ... and all with an impressive variety of style and subject matter. His opera Satyagraha was a triumph at the Metropolitan Opera, and one of BLO ’s greatest successes was Akhnaten in 2000. I worked with Philip (and director JoAnne Akalitis) on the world premiere (2000) of his one-act piece based on the well-known and dramatically disturbing short story by Kafka. I soon realized that this was a very powerful, tense, and concentrated composition (composed for two singers and a string quintet) neatly (almost inevitably) fusing the obsessive forward-driving energy of Glass with the subtle yet unstoppable theatricality of Kafka’s vision.